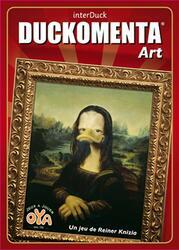 All museums compete for the works of interDuck, the mysterious duck entity. Will you be able to choose the trendiest works or even better, create the trend that will make your museum the most famous in the world? 95 interDuck works to admire and collect in this wonderful, simple, strategic and exciting game that will take you from antiquity to the Middle Ages and from the Renaissance to pop art. Contents of the box : 100 cards, 17 tokens, 5 summary cards, 1 game rule.